This summer, Editorial Assistant Emily and her boyfriend Kristian embarked on an epic 400km drive across the South of France in order to check out some new hotels and visit some old favourites. 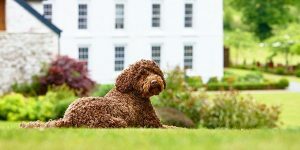 They travelled across 3 regions, ate 2 Michelin-starred meals and had one hell of a time – all in the name of bringing you the best boutique boltholes, of course! France truly is timeless. I’m always bowled over by the unique personalities of every region, but there’s always something universally French, too; perhaps it’s the bustling markets, enticing bakeries, quaint boutiques and sociable squares. And this was as true as ever on our recent trip, when we travelled from Languedoc, across Provence and along the Côte d’Azur. 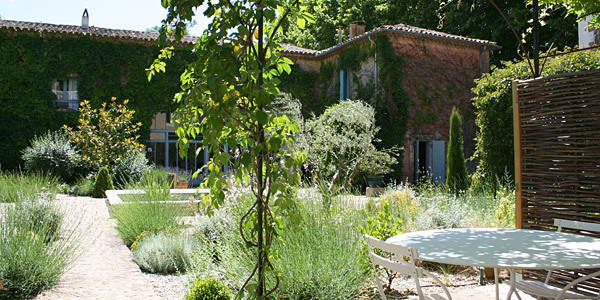 We started by touching down in Nîmes and driving to the tiny hillside village of Saint-Victor-des-Oules to visit converted farmhouse Le Mas des Oules, with its apartments for 2-6. We immediately set about exploring the gorgeous Mediterranean gardens, taking a dip in the pool and playing pétanque, before retreating to our stylish sanctuary. Here, we discovered that Le Mas des Oules is as special on the inside as it is on the outside, with designer furniture, Farrow and Ball painted floors, modern kitchens and gorgeous antique pieces collected from the local markets. We were mightily tempted to cancel the rest of our trip, hole up here and tell the office that all planes out of the country had been indefinitely cancelled. 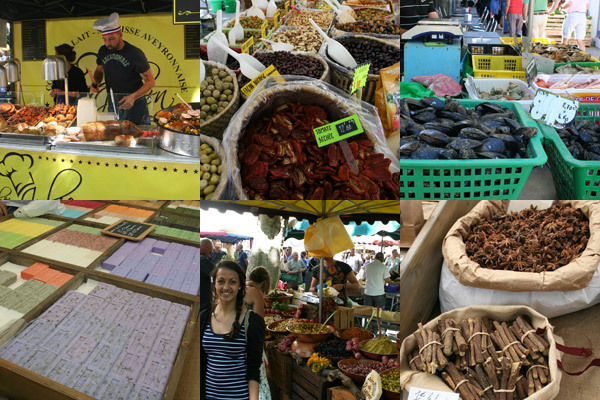 Le Mas des Oules’ owners Emma and Michael suggested we head out to explore the Saturday market in nearby Uzés, which is considered the best in Provence – apparently many people travel for over 2 hours to reach it! I could have happily spent all day walking through the maze of cobbled streets, gazing at local crafts and eating delicious produce. But Kristian insisted we head off in search of some history, too. Having spent his boyhood holidays camping in the region, he was keen to revisit the 360m-long, 50m-high Roman aqueduct the Pont du Gard to see if it was as impressive as he remembered. I think it’s safe to say that it was! After all this excitement, it was time for us to hit the road. 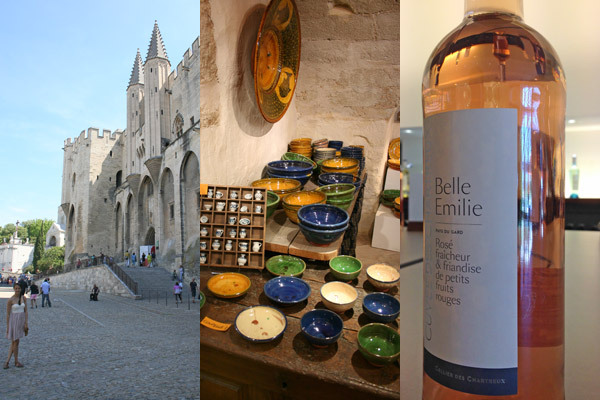 We drove through Saint-Quentin-la-Poterie (famous for its pottery), Tavel (famous for its wine, particularly rosé) and UNESCO-listed Avignon, before reaching Hotel du Clos, just inland from Antibes. After our journey we were ready for welcoming smiles and an afternoon of relaxation, which is exactly what we received at this Michelin-starred restaurant with rooms. 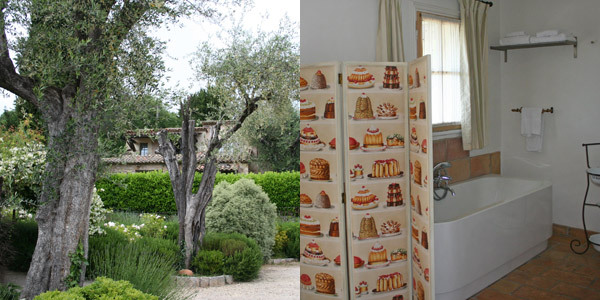 After a walk around the village of Le Rouret, a bracing jump into the pool and warming soak in the tub – and inspired by our baking-themed room – we headed to the restaurant for tea. We arrived to find a candlelit table on the terrace, with blankets in case we got cold, a glass of pastis for him, and champagne for me. Head chef Daniel Ettlinger creates truly magic dishes: we feasted on Spanish omelette topped with goat’s cheese, followed by a choice between a delicately battered sea bream fillet or duck breast with potato and asparagus. Our cheese platter and pudding were exquisite, too. The following morning, after an incredible breakfast (violet syrup on yoghurt is my new favourite food), we were back on the road, speeding towards the former Swedish royal residence Chateau Eza, located between Nice and Monaco, which offers breath-taking views along the Côte d’Azur (our jaws were open for most of our stay; the vistas really are incredible). 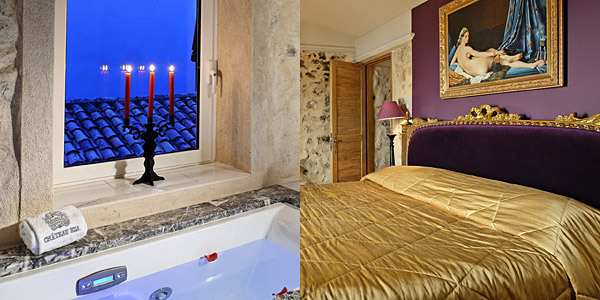 We fell in love with Eze, a tiny pedestrianized village 400m above the Med, but found it incredibly hard to leave our palatial suite with its sunken Jacuzzi, 2 bathrooms, plum velvet, oil paintings and plush sitting area. 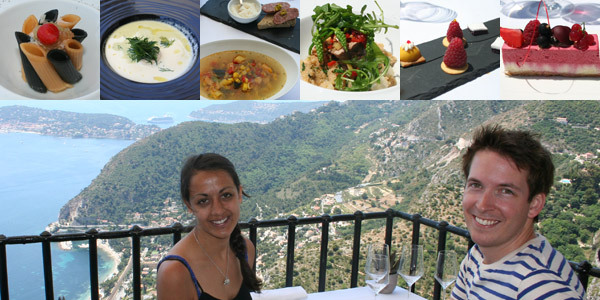 But it’s not just the rooms and views that make this place special; there’s a Michelin-starred restaurant here, too! Having secured ourselves a table for lunch, we embarked on a 4-course culinary extravaganza, with a private dining terrace, views to die for, and smiling waiters whose recommendations would steer us through the following hours. Asparagus soup and crab topped with tangy Australian lemon caviar were highlights. With full stomachs, it was time to descend to Nice for the final stop of our epic journey. The city is synonymous with modern art, so where better to stay than Hotel Windsor, where rooms have been decorated by artists? There’s an ancient Chinese throne in the lobby, a giant musical bamboo mobile, a lift designed by Andy Warhol’s muse Ultra Violet, and original Tintin posters on the walls. 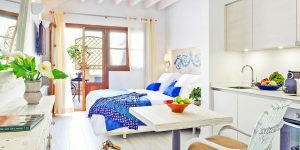 We stayed in a bright room designed by François Morellet, but our favourite was Samta Beyahia’s Tunisian blue bedroom. As we strolled from Hotel’s Windsor’s secret garden (complete with pool and parrots) through Nice’s centre to the Promenade des Anglais, we couldn’t help but think how special each hotel was, and just how different they had all been. Yet each retained the same quaint French charm, along with an exceptional eye for detail. All in all, we’d had a remarkable time. 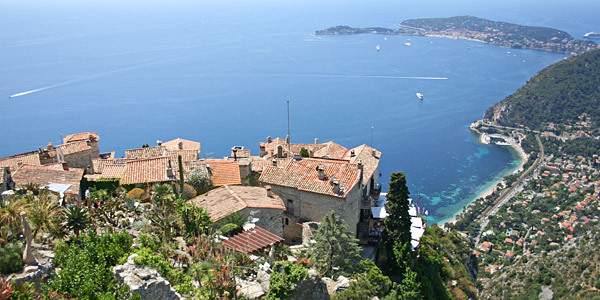 Many of our hotels in southern France get booked up quite far in advance; find out more about this incredible area and book your 2015 French sojourn.